I was able to get an awesome return for my Julio Arias Bowman Sterling auto that I won in a Box Break over Instagram a few weeks ago. Another "instagrammer" messaged me and asked if I would take the above Chris Davis 2013 Topps Five Star jumbo relic and the below Bowman Sterling Dylan Bundy auto for the Arias. I couldn't resist that. Steve, the guy I traded with, even sent first and requested that I hold off on the trade until I got my card in. You couldn't ask for a better trade. I wish they could all be this way. 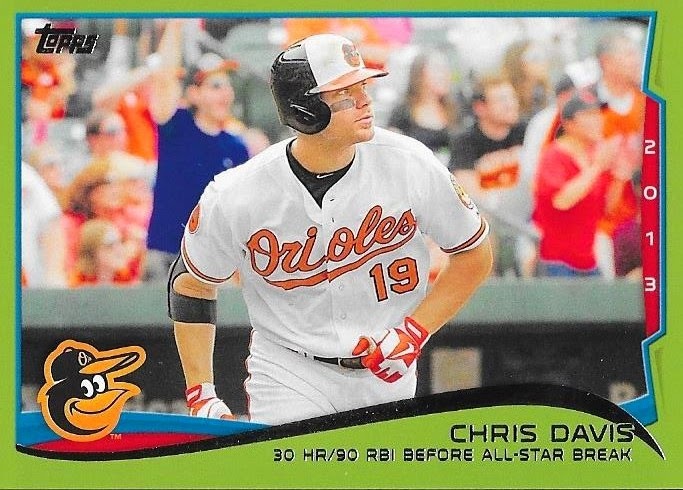 Both cards are great, but the Davis was the gem of the deal, in my opinion. I do have a fellow Orioles fan that I just met who is asking about the Bundy. I normally wouldn't be inclined to trade it, but I definitely want to hear his offer. 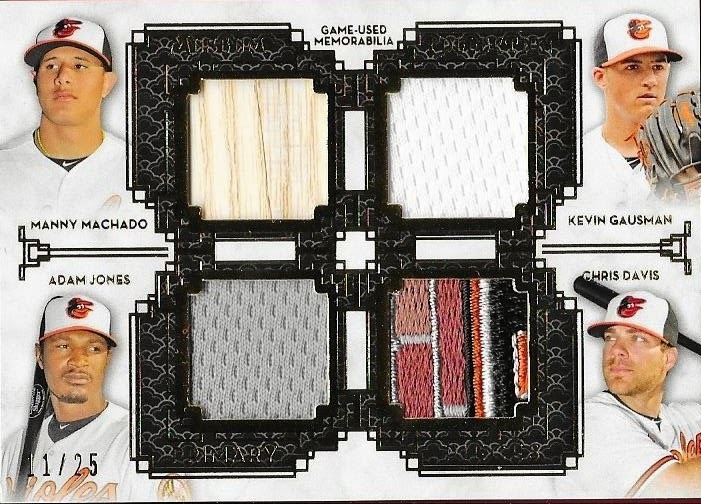 It would be really cool to be able to take a couple bucks spent on a box break and turn it into quite a few PC needs. We'll see, but so far, I have had a tremendous return. I finally remembered to take one of my huge boxes of trade bait to my parents' house this past weekend and made the trek across the street to trade with my older brother, John. 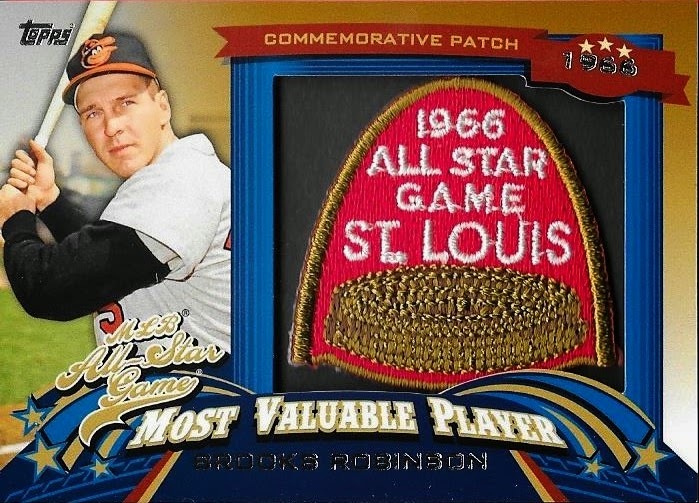 I gave John a Ted Williams manufactured awards relic and he hooked me up with this cool Brooks Robinson All Star Game manufactured patch from 2013 Topps. John gave me this awesome Virgil Trucks card, the only flaw being the spot near his eye. It's ok, because I am a fan of any Virgil Trucks card. His 97th birthday was on the 26th. I took a moment on that day to pause and reflect on how awesome the man was and how I miss him, even though I never met him. 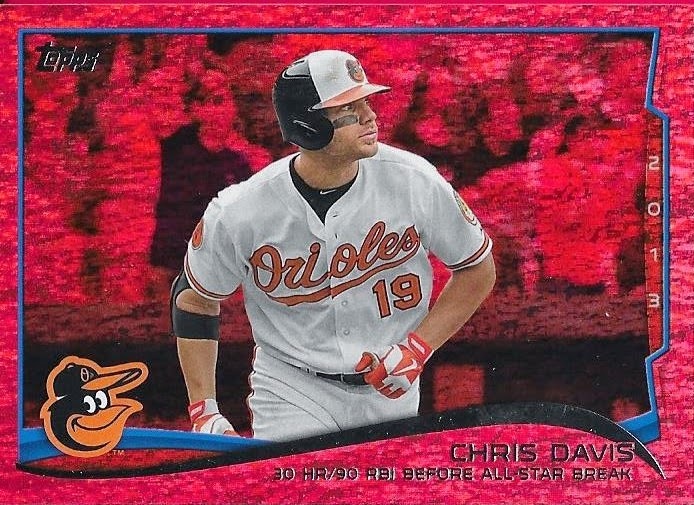 John traded this 2014 Topps Red Hot foil Chris Davis to me for a Ted Williams WWII card that I had. I don't remember what year those were from, 2010, maybe? I thought I had one of these Davis's coming in a trade, but I don't know what happened there. Oh well, I have it now. For a Jim Rice Silver Slugger Award manufactured card, John hooked me up with these two Manny Machado RCs. The above card is a Topps Finest refractor and the below card is the Bowman Platinum red parallel. Neither is numbered, but they are both really nice. So, thanks for the cards, John. I need to build back up some Red Sox inventory, but with all of the friends I have that collect Red Sox, it's tough. While I was visiting my parents this weekend, I stopped by the new card shop in Winston-Salem (actually, Clemmons) and picked up quite a few vintage cards for my sets. 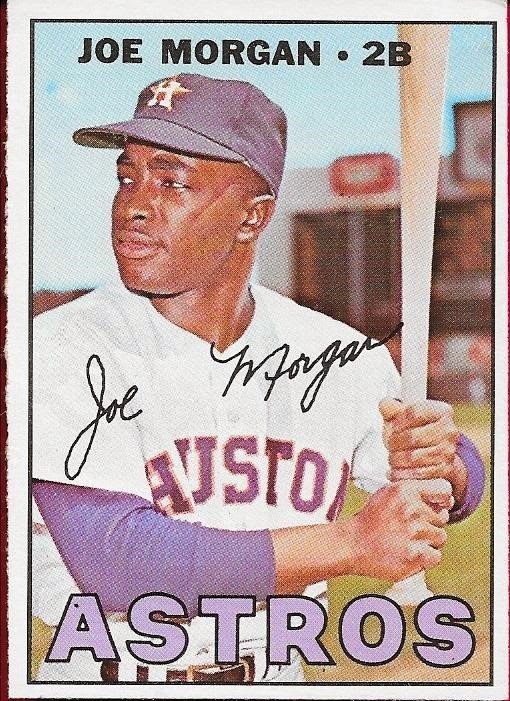 I also got the above 1967 Topps Joe Morgan for my now-growing Morgan PC. The '67 is in pretty good shape and I didn't spend a whole lot on it, so I'm happy. I was even happier to knock off two Hall of Famers out of my 1969 set. I got the above Clemente and below Kaline for a combined total of $20 plus tax, so that was really nice. I got those two, the Morgan and a 1966 Bob Gibson for a total of $30, so I think their prices are really fair. I'm happy to be knocking out some bigger cards from my 1969 set. Maybe I'll be able to finish it sometime soon, so I can move onto another 60's set sooner rather than later. I completed a trade a few weeks ago with a guy on Instagram named Nick. He and his son have been following me for a while, so it was nice to finally pull off a trade. 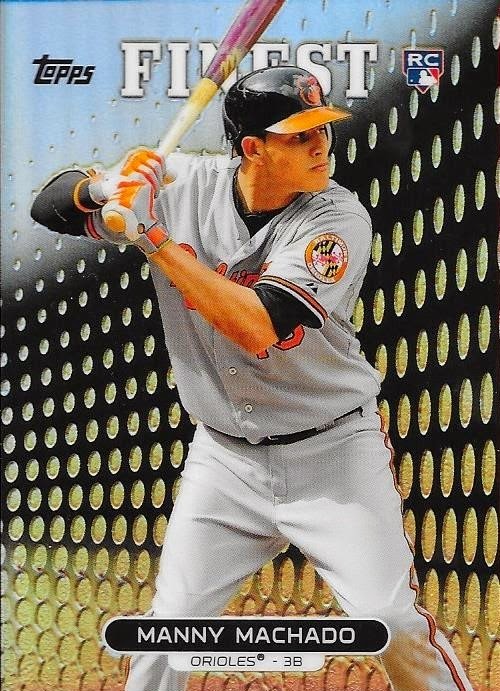 I sent him a 2014 Topps Museum Collection Anthony Rizzo green parallel and he hooked me up with some nice Orioles stuff. The key to what I got in return was this 2014 Topps Chris Davis blue parallel and the below 2013 Topps Chrome Manny Machado RC for my set. 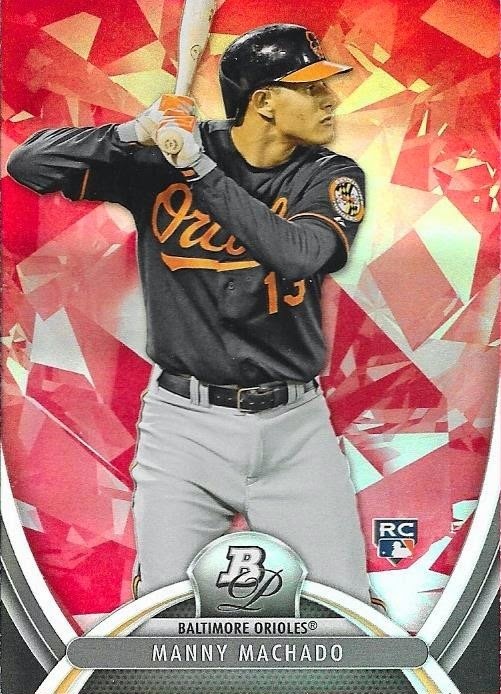 I could have sworn that I had this Manny in my PC, but if I do, it is nowhere to be found, so I had to deal for this one so I could add it to my set I'm glad I did because my 2013 Chrome set is winding down. It'll be nice to put this one away and then I can maybe concentrate on something ese. Thanks for the trade, Nick! 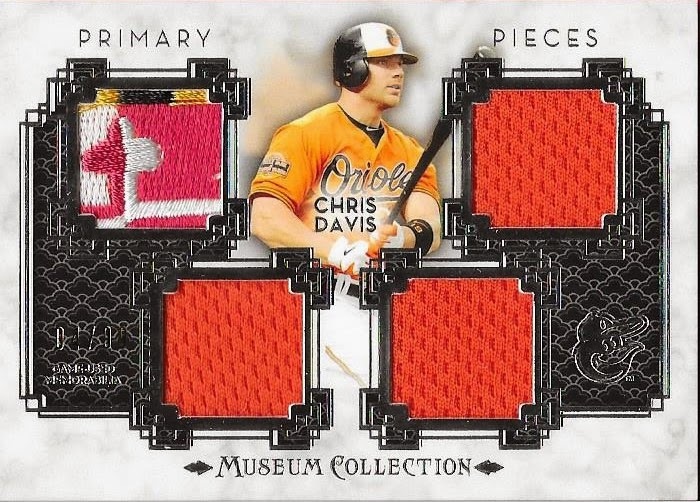 Thanks to my buddy Michael, I was tipped off on another Chris Davis quad patch card from 2014 Museum Collection that had a really cheap Buy It Now price of $45. This time, the card has more of the Maryland flag patch and it looks really cool. The card is numbered 4/99. I can't get enough of these cards and I can't sit here and tell you that if I saw another at that price, I wouldn't pick it up. These have definitely been great pickups for my Chris Davis PC. 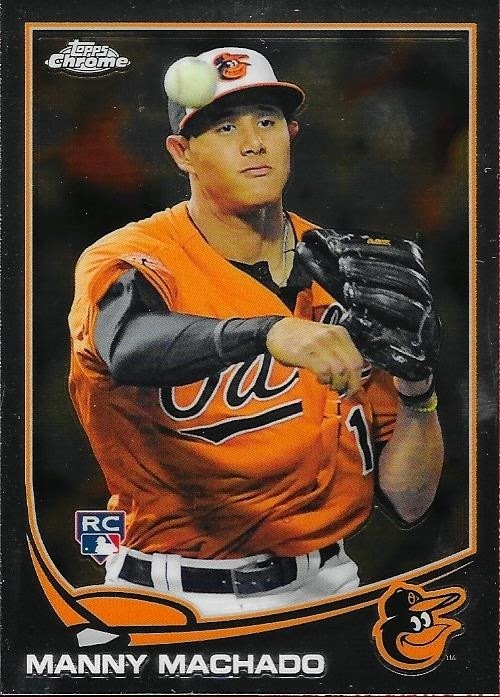 Let's just hope the Orioles sign him long-term and he can be an Oriole for a long time. 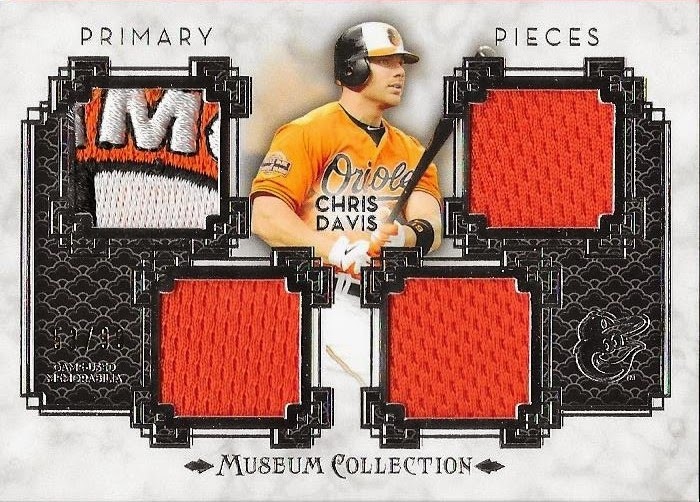 Thanks to my very good friend, Andrew, I was able to find this amazing 2014 Topps Museum Collection Chris Davis patch card on Ebay. Something really cool about the card, that I didn't catch right away, was that it was numbered 53/99. Chris Davis hit 53 home runs last year. EBAY 1 OF 1 BABY! As you can see, the card is amazing. It has part of one of the sleeve patches, likely the Maryland flag portion. The card scanned really nice, as well. It did set me back quite a bit, but I didn't care. The card is amazing and I'm glad I have it. Thanks for spotting it for me Andrew. Speaking of Andrew, he is having a contest over at his blog. Who doesn't want free cards? That's right, so head on over there and sign up. Maybe you'll get something cool for free from an awesome guy! You can find his blog right here. Not only did I get a few set needs and my Larry Doby signed baseball from AAA Collectibles in Matthews, NC this past weekend, I also got this awesome Joe Morgan rookie card. The card is from 1965 Topps and set me back only $20. Not bad at all! 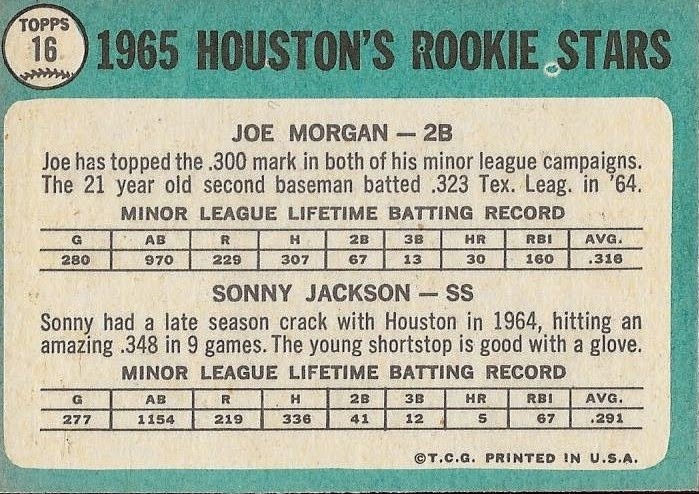 I think it is really cool to read the back of a future Hall of Famer's rookie card to kind of see what the scouting report was. Sonny Jackson must enjoy sharing his RC with Morgan. 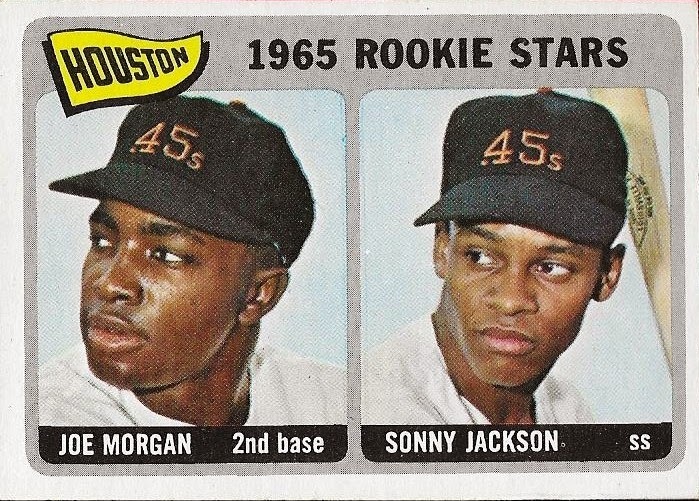 Jackson played in the majors in parts of 12 seasons but obviously never gained the star power that Morgan had. So, I guess I wasn't kidding when I said that I was going to do a PC of Morgan's base cards. Ive got a few, now, and I think I will be adding some more soon. I know I love this RC and am really happy that I got it for as cheap as I did. But wait, there's more. 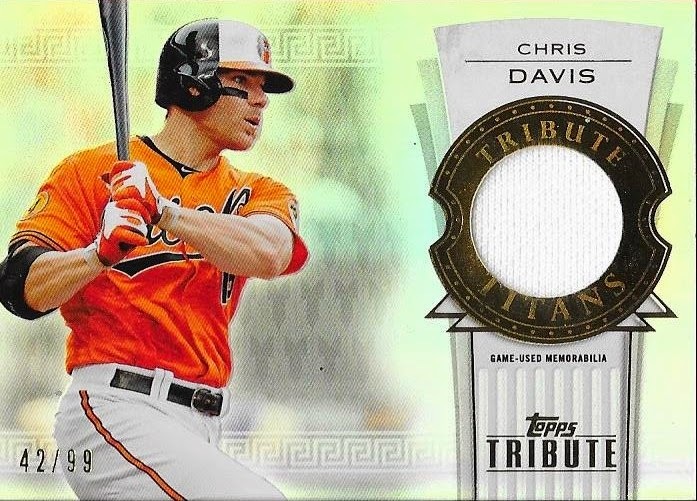 For an additional $10, I got this 2014 Topps Tribute Chris Davis relic. I think at $10, this was an absolute steal. Davis has gotten off to quite the slow start so far this season, but I have faith in him that he will get red hot and still hit 35-40 homers this year. We'll see though. So, I think I had a productive trip to the Matthews shop. I hope that if any of you are in the Charlotte area, that you would go by and check it out. The folks who own/run it are amazing and you'll find some sweet deals! I spent this past weekend visiting the inlaws in Charlotte for Easter, so while I was in town on Saturday, I made the short drive to one of my favorite card shops, AAA Collectibles, in Matthews, NC to visit for the first time in about 5 years or so. The proprietors, Bob and Linda, are some awesome folks and I was happy to reconnect. I'm sure they were happy, too, because I spent a good bit of money on some 1959 and 1969 set needs, a Chris Davis card, a nice vintage RC that will be shown later on and a Tim Lincecum card for Chris. Something else that caught my eye was that they had a great price for signed Larry Doby, JSA authenticated baseballs. So, I exceeded my budget and grabbed one, since this was substantially less than what I had been seeing online. I was happy to add it to my collection at Hall of Fame baseball #102. Larry Doby (b. 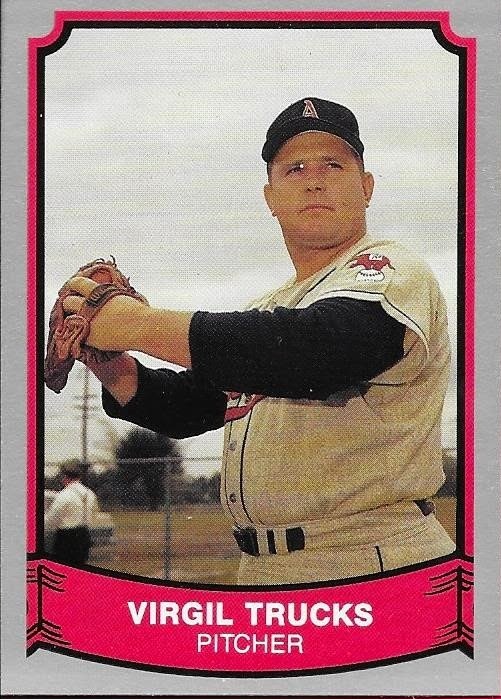 1923 - d. 2003) played in the majors from 1947 to 1959 for the Indians, White Sox and Tigers). He was the first black player to play in the American League. He and Satchel Paige were the first black players to win a World Series when their Indians team won in 1948. Doby, in his Major League career, had 1,515 hits, 253 home runs and an average of .283 over 13 seasons. He led the league in home runs twice with 32 in 1952 and 1954. He finished as high as second in the AL MVP voting (1954) and was an All Star in 7 seasons. He was elected to the Hall of Fame by the Veterans Committee in 1998. My wife keeps telling me that I need to find some trade partners who are closer to my age. She may be right. I think the average age of the folks I trade with is something like 14, but recently, I met a guy on Instagram named Tim who had something I really wanted (see above). Does it matter that I met Tim through his son, Carson, who is 11? Nah, I don't think so. 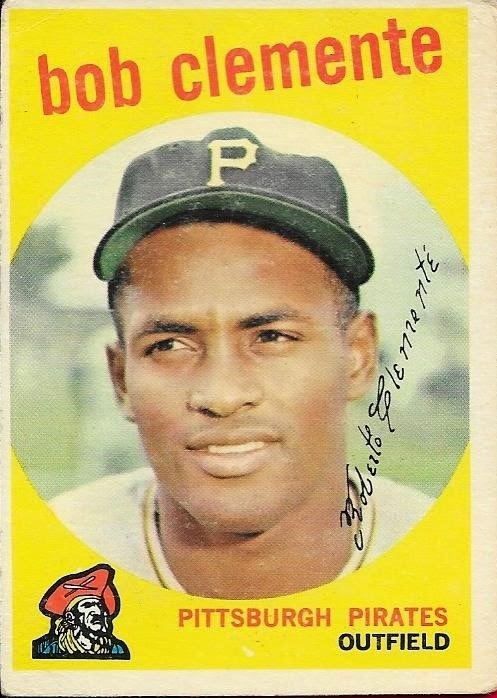 Anyway, Tim's son Carson is a huge Roberto Clemente fan and he was in love with a card I had posted as not for sale or trade on Instagram a few months ago. Well, everything has its price and the price for that Clemente (and a few other cards) was this 1969 Topps Mickey Mantle for my set. As you can see, the Mantle is almost flawless. It is slightly offcenter, but I'm ok with it. 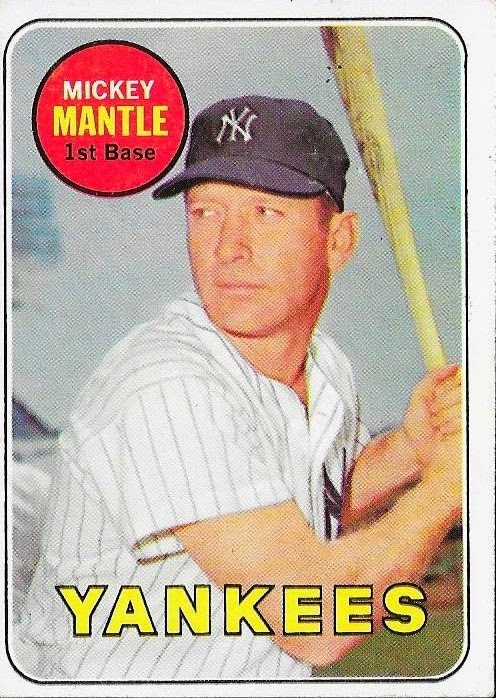 This is Mantle's last regular issue Topps card and it is a High Number (I think, since it is card #500). I am happy to add it to my collection. 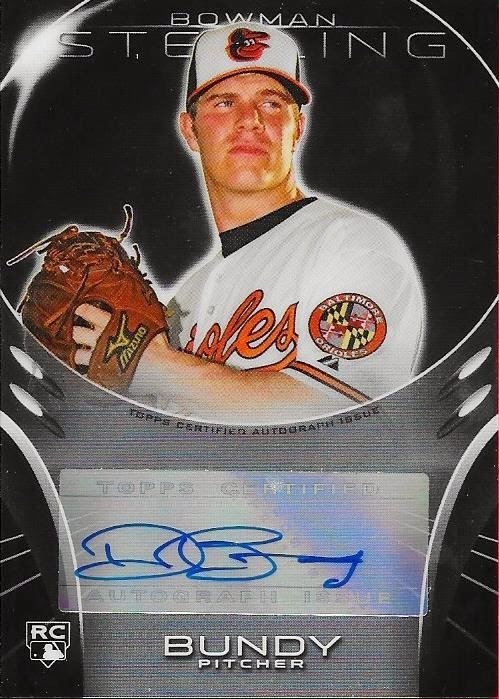 Tim also added some oddball Orioles cards to the trade package that grew out of the Mantle and took on a life of its own. I was able to snag all of this stuff by meeting a lot of Tim and his kid's needs with several autographs and relics from recent Topps offerings (and one Donruss auto as well). 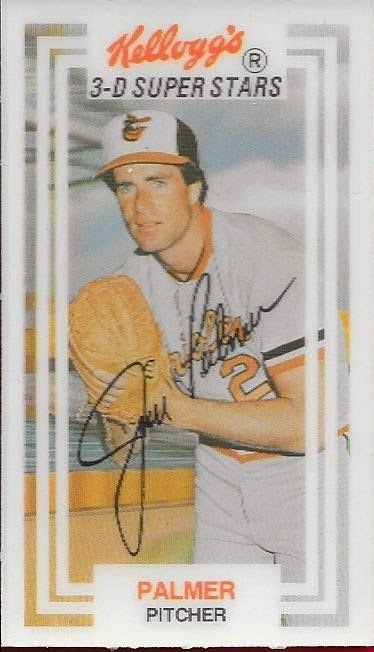 This above Kellogg's Jim Palmer is especially nice, since most of them curl and crack over time. 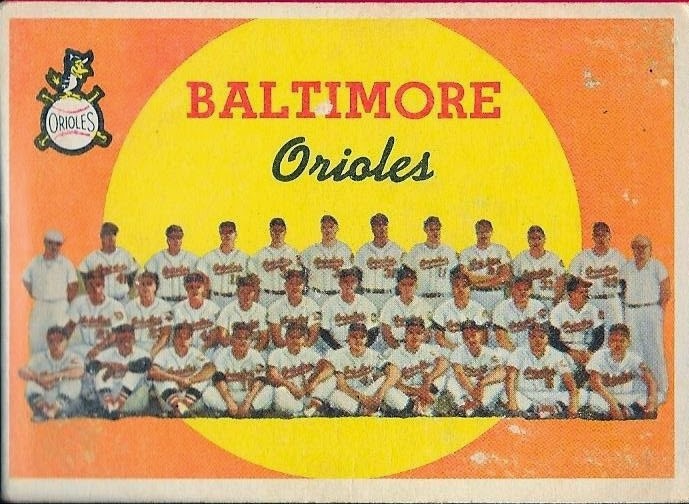 Tim helped me knock off a 1959 set need with this Orioles team card. Not too bad condition, either. 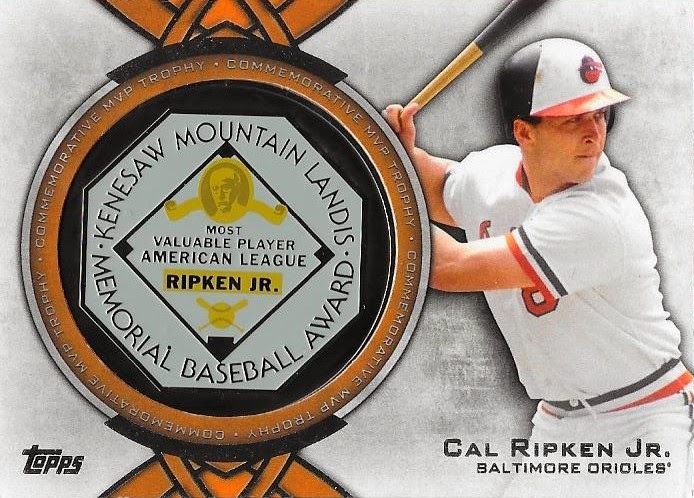 Another big piece in the trade was this Cal Ripken Award Winners manufactured relic. I had been looking at these for a while but I hadn't been able to jump on any. So, now I don't have to. 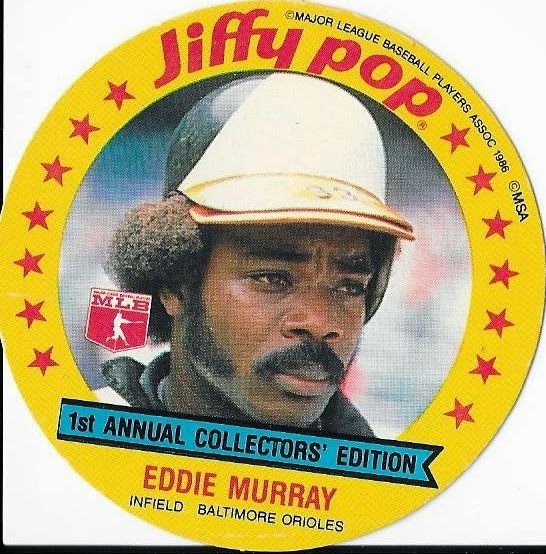 Here's another oddball Oriole, this Jiffy Pop Eddie Murray from 1986. This is a really cool card. So, thanks for the epic trade, Tim, I really appreciate it. I know we will do some more trading soon. 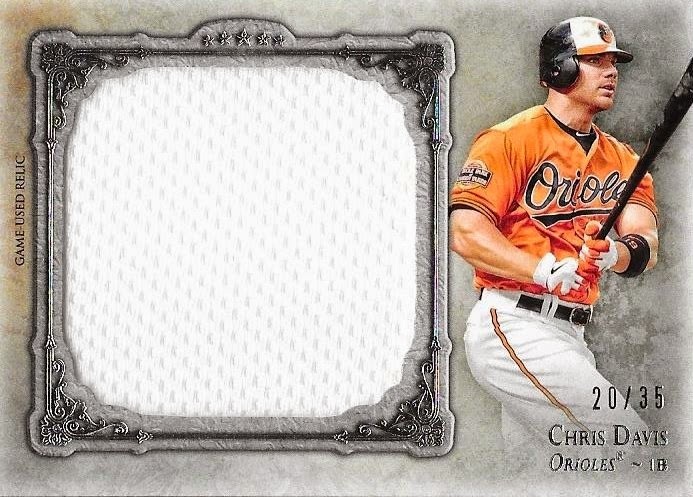 I made a deal with a kid named Adam on Instagram recently when I purchased this 2014 Topps Museum Collection quad relic Orioles card. I might have overpaid by just a little bit, but Adam seems like a good guy and I didn't mind helping him out in exchange for this card. 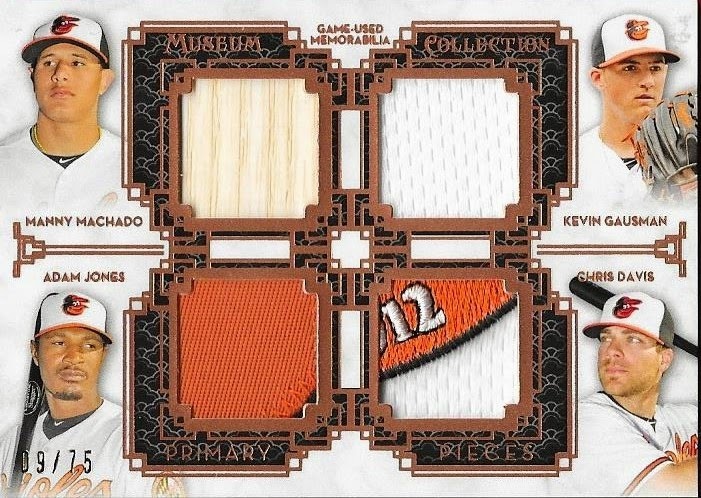 This one has patches from Manny Machado and Adam Jones and jersey relics from Kevin Gausman and Chris Davis. The card is numbered 33/99. I know I've said it already, but I'll say it again, I love Museum Collection. I have two more of these cards I want to show, so keep on the lookout over the next few days. I have a ton of other stuff I want to show off, too, so I may mix other stuff in here and there. Thanks for the deal, Adam, I hope we can trade again! Ok, I'll admit it. 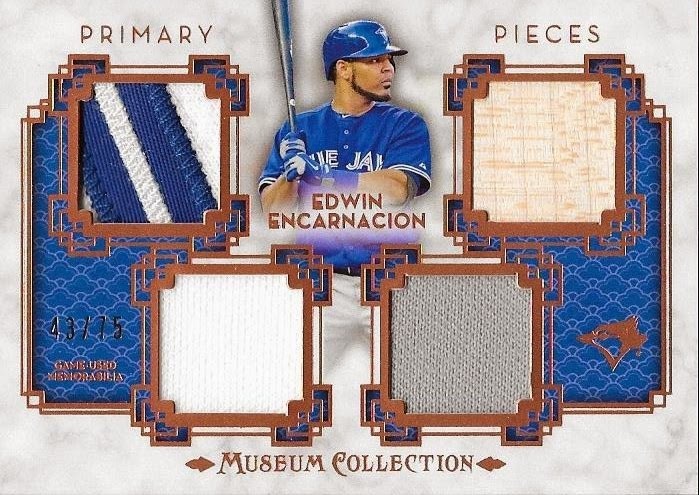 I have never been more excited about a high end product than I have been about 2014 Topps Museum Collection. Ok, well, I did LOVE 2006 Upper Deck Epic. 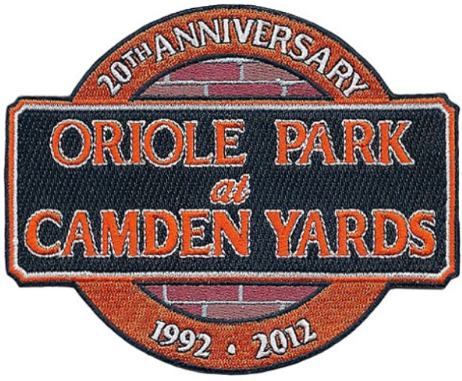 Anyway, the Orioles patches I have seen on the 2014 Museum Collection cards have been amazing. To me, this is just an amazing patch on a card. I won't use the term "sick" because I feel like that is overused, but it definitely is amazing. THanks to my good buddy, Michael, for providing me with a picture of the actual patch. Just so you guys know, I have a few more of these patch cards coming and you know that each will be posted on here. Something else I picked up from the most recent Collectauctions.com auction was this Phil Cavarretta signed baseball. The ball was part of a lot of two signed baseballs. The second ball I didn't need (a Bobby Thomson ball - I already have a ball signed by Thomson and Branca), so the key to the auction was this Cavarretta. I wanted to pick it up because I had heard that in the past, Cavarretta had been a great TTM signer, but unfortunately, I missed the boat on getting him and he passed away before I could send a ball. Cavarretta (b. 1916 - d. 2010) played in the majors from 1934 to 1955 for the Cubs and White Sox. He had 1,977 hits, 95 home runs and a lifetime batting average of .293. He was the NL MVP in 1945 when he captured the NL batting title with an average of .355. His MVP award is (much like Marty Marion) is likely the product of wartime baseball, but I still think this is a great addition to my collection. Cavarretta did lead the Cubs to the World Series in 1945, which they lost to the Detroit Tigers (a team that I know a lot about, given my research on Virgil Trucks). Coincidentally, 1945 was the last time the Cubs have been to the World Series. It has been a little bit since I have added a new baseball to my Hall of Fame collection. This ball, my 101st, is of Red Sox legend Carl Yastrzemski. I got the ball for a steal during the Spring auction at collectauctions.com. Yastrzemski (b. 1939) played in the majors from 1961 to 1983, all for the Red Sox. 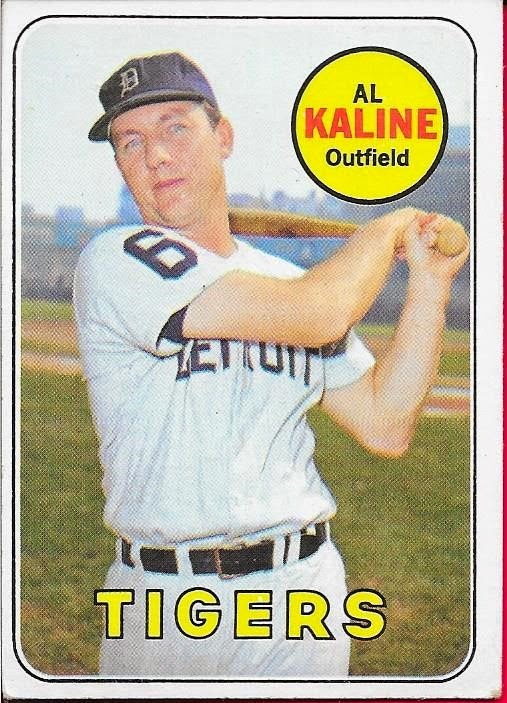 He was the 1967 AL MVP when he captured the Triple Crown while batting .326 with 44 home runs and 121 RBIs. He had amazing career numbers as well, collecting 3,419 hits (8th all-time), 452 home runs (35th all-time), 1,844 RBIs (13th all-time) and a lifetime batting average of .285. Yastrzemski was a 3-time AL Batting champ (1963 - .321; 1967 - .326 and 1968 - .301). His Triple Crown year was the only year that he led the league in RBIs and home runs. Something funny to note, although he had seasons where he hit 40, 40 and 44 home runs, he never had a season where he ended with a home run total in the 30's. Take away those three seasons of 40 or more homers, he only had 5 seasons where he hit 20 or more with totals of 20, 23, 21, 28 and 21 home runs. Furthermore, in his Triple Crown year, not only did Yastrzemski take top honors in those categories, but he also led the league in runs scored, hits, OBP, slugging, OPS and total bases. It is common knowledge that Yastrzemski never won a World Series. Though, it is no fault of his own when you look at his stats. 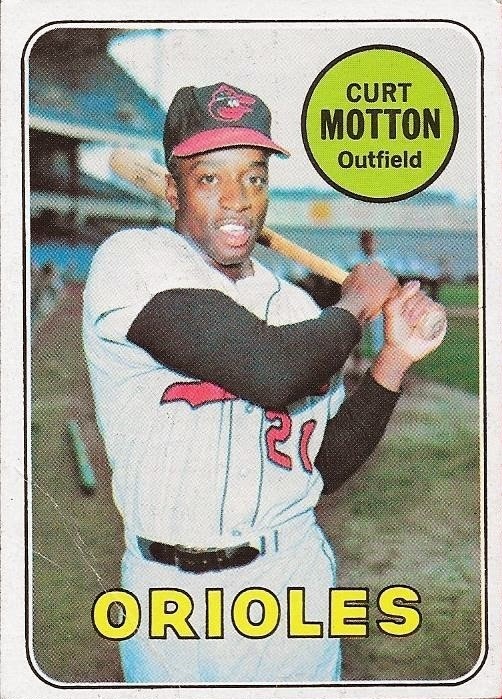 In the two World Series in which he played (1967 and 1975) he batted .352 with 3 home runs and 9 RBIs in 14 games (this means both World Series went 7 games). Yaztrzemski was elected to the Hall of Fame in 1989 (his first ballot) when he was named to 94.6% of the ballot. I got a nice surprise package not too long ago from TJ, the Junior Junkie that had a good bit of set needs that he had seen on my wishlist. In the package were 1 - 1959 Topps card; 3 - 1969 Topps cards and 4 - 2013 Topps Emerald parallels. It was really awesome of TJ to randomly hook me up. I have a stack of Griffeys that I will be sending his way shortly. Thanks so much for the cards, I really appreciate it! 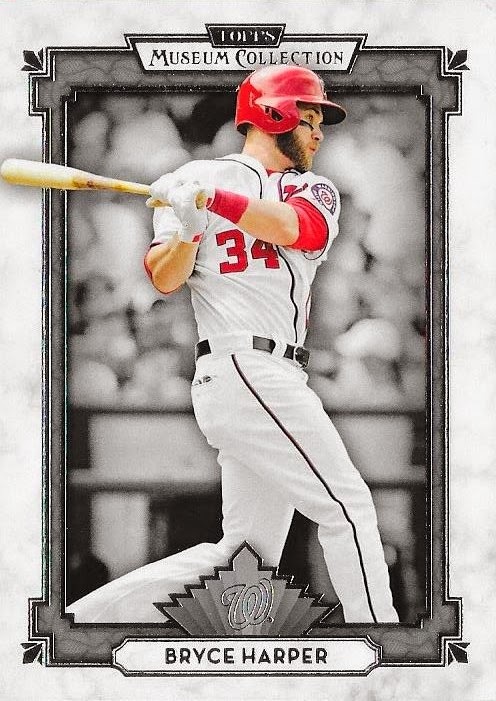 Here is another card in what is becoming a long line of cards that I have gotten from trades and/or purchases off of Instagram. 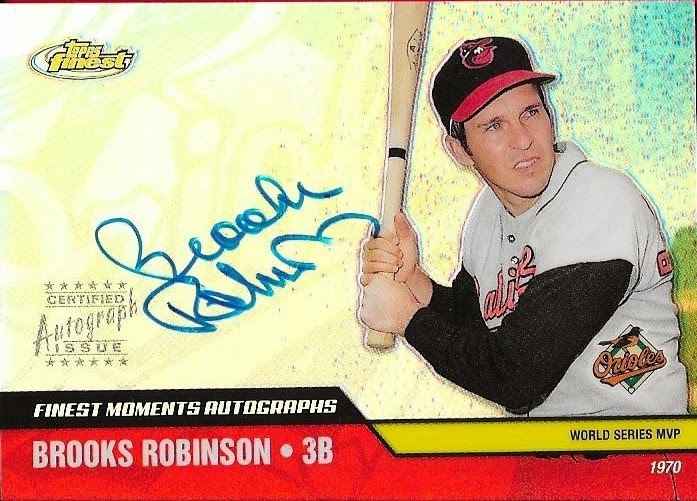 I got this 2002 Topps Finest Brooks Robinson auto off of a guy who, with his cousin, are the first people I met off of there that are actually from NC. Pretty cool, right? Sadly, though, they are from the Wilmington area, so that 2 hours or so drive rules out any kind of trade day or anything like that. I'm really hoping I can organize something soon, because I would really love to do some more in person dealing, but I can't afford the table prices at the card shows. Anyway, this card is SHARP! I paid $15 Paypal for it, and I know I probably could have gotten it maybe a hair cheaper, but I don't care. The card is really nice and now its mine! I can't believe how I didn't know about this one before now. 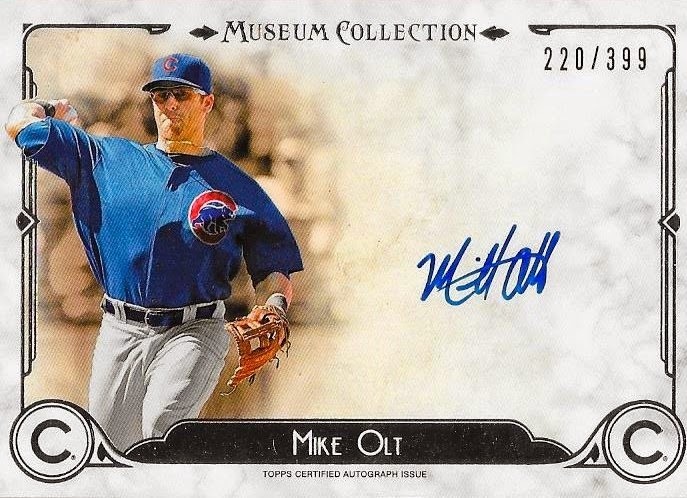 I love the bold colors of it and don't look now, but its an 'on card' auto! 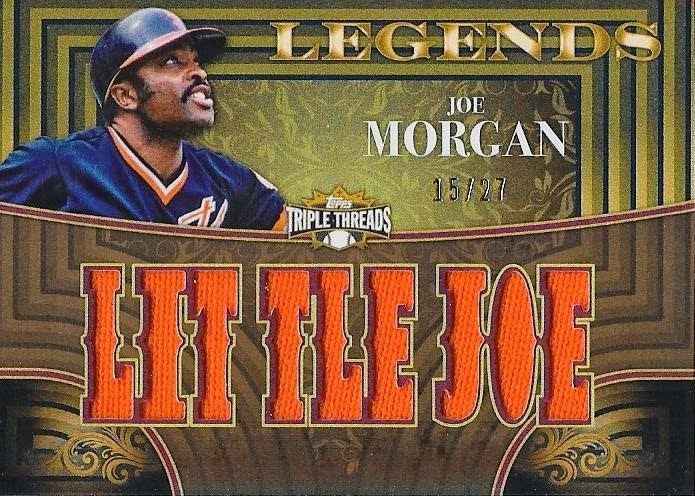 One of the coolest cards I got in my latest package from Dana was this Joe Morgan 2013 Topps Triple Threads relic. The card is amazing and is numbered 15/27. Since we had met Morgan twice, and that he was really cool to us, I decided I wanted to do a kind of PC of him. Maybe not all of his inserts (for now at least), but I want his RC and definitely some relics and stuff. 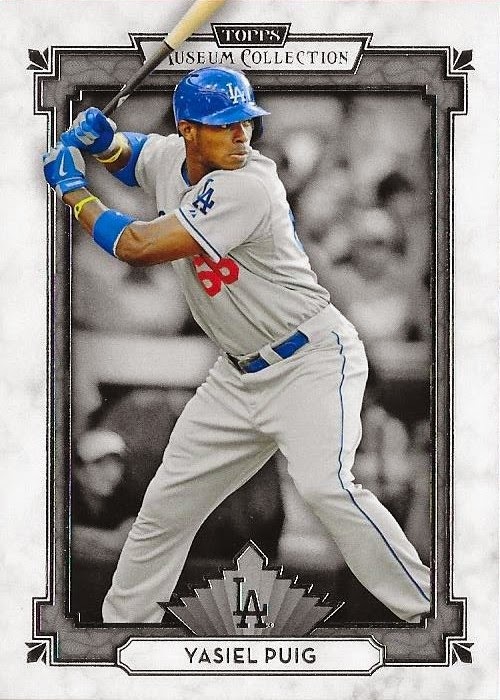 I also will probably get all of his Topps base cards as well. 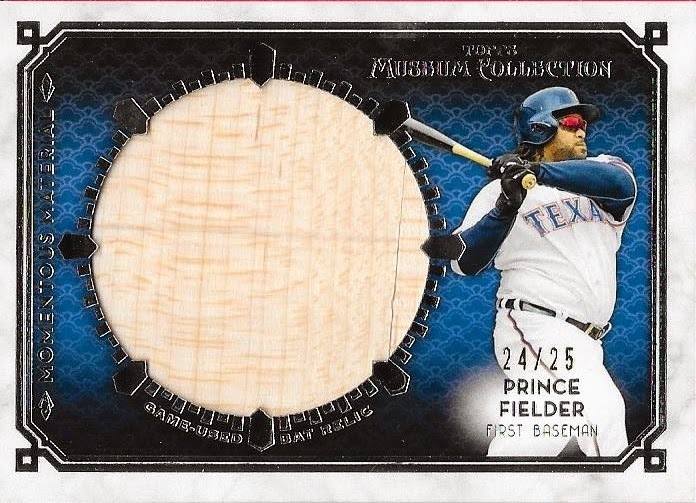 I love this Triple Threads card. Again, thanks so much for the trade, Dana. This card is amazing! 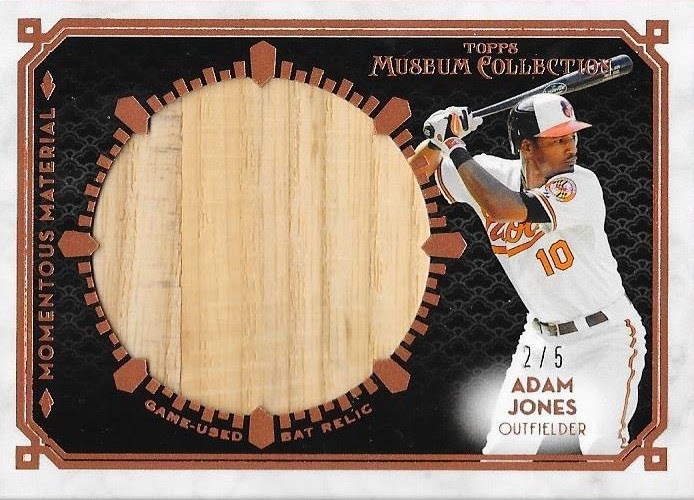 I got this amazing Adam Jones jumbo bat relic as part of my latest package from my friend, Dana. This card has a huge piece of bat and is numbered 2/5. AWESOME! I don't have a whole lot of Adam Jones autos or relics, so getting this card in my collection is huge. Thanks so much for the card, Dana! I got excited last night and spent some of my tax return on a box of Topps Museum Collection. I don't buy high-end stuff much at all, but I figured that since I was doing well money-wise, it would be fun to break a box. I picked up the box at my LCS and broke it here at the house over Skype with Andrew. I didn't get any huge hits and nothing for any PCs, but I had a good time busting it. What I wasn't expecting was the contentious negotiations that followed when I posted some pics of the cards in various trade outlets. Look, I know someone want to get stuff for cheap, but it baffles me when someone gets downright rude when they don't agree with what I'm looking for in return. You can just say no and move on. Anyway, Listed are all of the big hits and a couple base cards that I'm willing to sell (via Paypal) or trade (for comparable Orioles). If you're interested, great, drop me a line. If not, that's cool, too, just enjoy looking at the cards. I'm inclined to keep them instead of yard sale them anyway. 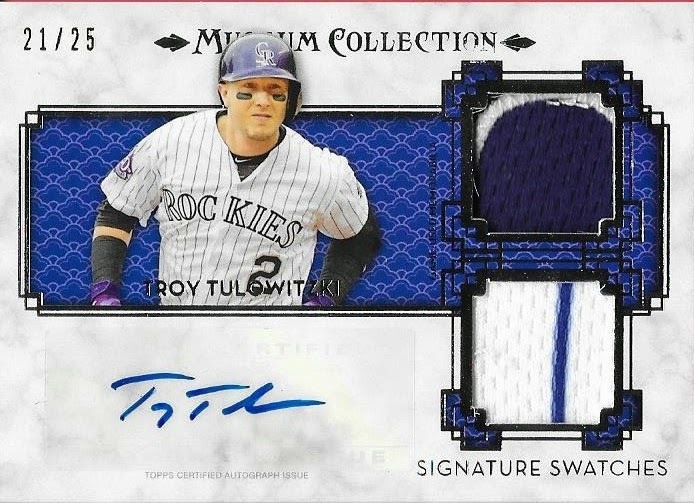 I thought this Tulo was pretty cool and so did everyone else who wanted to trade for it. I almost had a deal, but the person got cold feet at the end. Oh well. This one was the source of my frustration. Someone told me that one sold for $10 on Ebay and that was all I would get for it. To that, I say: "Then you should have bought the $10 on Ebay, then." because there is no way in hell I am letting this go for only $10. I don't care what the completed listings say (and I looked, there were none that went for that low). Finally, here are a couple base cards. I would be happy to trade these for Chris Davis base out of Museum or Tribute, if anyone has them. I'd also be interested in Jones and Machado as well. So, thanks for listening to me vent, guys. This is why I typically hang onto my cards or just sell them on Ebay. It seems that everyone wants something for nothing. Very rarely do I put cards in magnetic cases anymore. Even rarer do I have to buy a magnetic case immediately after I get a trade package in. Well, today, I got a team bag full of Orioles as well as 3 amazing relic cards from my friend, Dana. 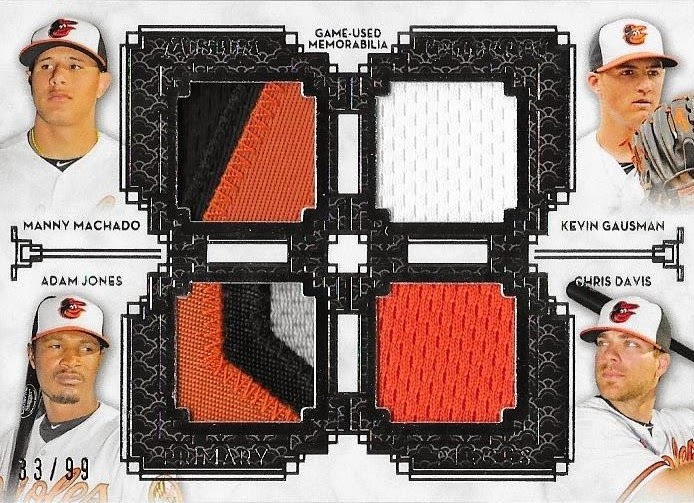 The first card I just had to show off right away, this 2014 Topps Museum Collection quad relic of Adam Jones, Manny Machado, Chris Davis and Kevin Gausman. Just look at the Davis patch. Wow. I'm at a loss for words. So, I'll just let you all bask in its glory and I'll close by thanking Dana once again. You, my friend, are AWESOME. Thanks! I got a nice package in the mail the other day from my very good friend, Andrew. I send him care packages of cards all the time and he does the same for me. We don't even do trades anymore, since we just send each other stuff we think the other would like. In the package was a bunch of Orioles stuff that I needed for various PCs and two 2013 Topps Chrome cards that I needed for my set. I really appreciate the cards, Andrew! Thanks so much! I joined a box break on Instagram last week and pickup up 3 slots. The teams were randomized but, luckily, I still got the Orioles. I also got the Dodgers and Marlins. I didn't get any Orioles or Marlins, but I did get two Dodger autographs from the break. 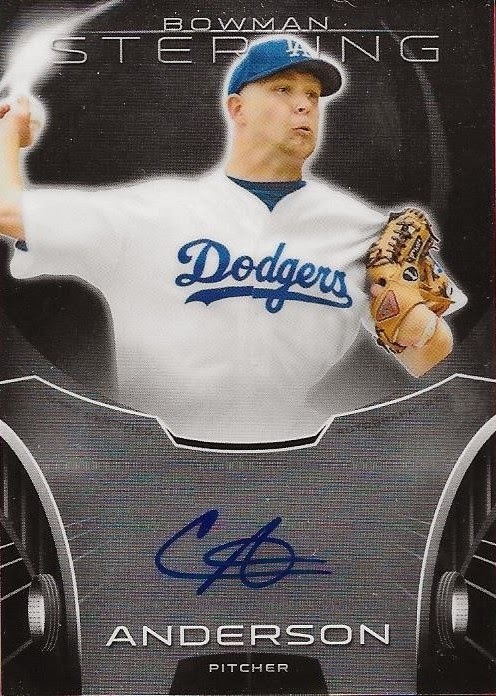 The above Chris Anderson and below Julio Urias. From what Austin, the Urias was the hit of the break. I looked the card up, and yeah, they are selling on Ebay for around $40. So, that being said, these cards are up for sale or trade. Something comparable of the Orioles would be nice. If anyone is interested, please let me know! 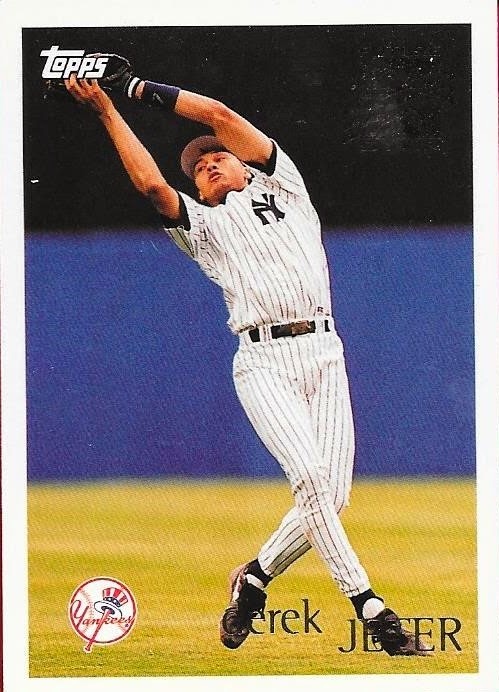 Well, I was able to complete another mid-90s set today when a package from Sportlots came in with the above 1996 Topps Derek Jeter card. I had gotten the Giambi card that I needed on Sunday when I got home from camping. Kind of fitting that the last card I get for the set is the Jeter and he is retiring this year. I'm sure Drew has a special place for this one. So, now, I need to finish 1994 and 1997 that I have started and I need to really hit 1995 hard so I can get caught up on the 1990s sets. These didn't take long, at all, so I know 1994, 1995 and 1997 can be had pretty soon. This trade took some work, but I finally got it completed. I'm really glad, too, because I knew the guy I was trading with was a good guy, he just ran into some issues completing the deal. 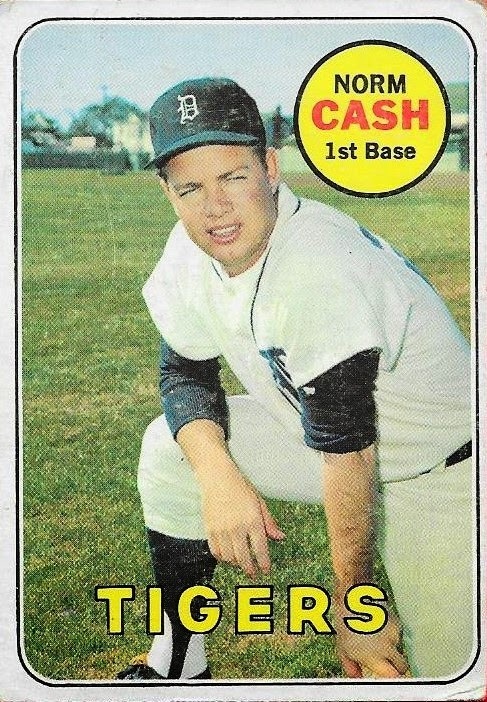 Anyway, I got a total of 15 1969 Topps cards from a kid named Peter from Instagram. They are a bit lower-grade, but most of them will be able to fill my set, since I can't afford to do Mint vintage. In the package, I got 10 cards I could use, and 5 others were too rough, like the John Roseboro, since it had a piece of tape on the bottom. I might flip the 5 I wont use to some other kids on Instagram in a small deal, or I may flip them to other bloggers, if there is any interest. 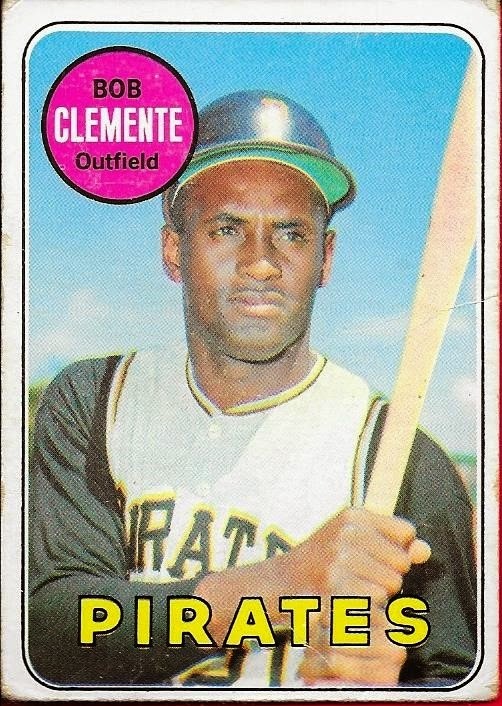 I'm posting early because I have plans tonight, but I wanted to show off the 1959 Topps Roberto Clemente that I got off of Ebay. The condition of this card is pretty good, considering I spent only $15 on it. Not too bad, I think. I don't like how they refer to him as "Bob" though and as far as I know, he didn't like it either. It seems almost disrespectful. I don't know. Clemente was amazing and I'm glad I was able to get this one really cheap! 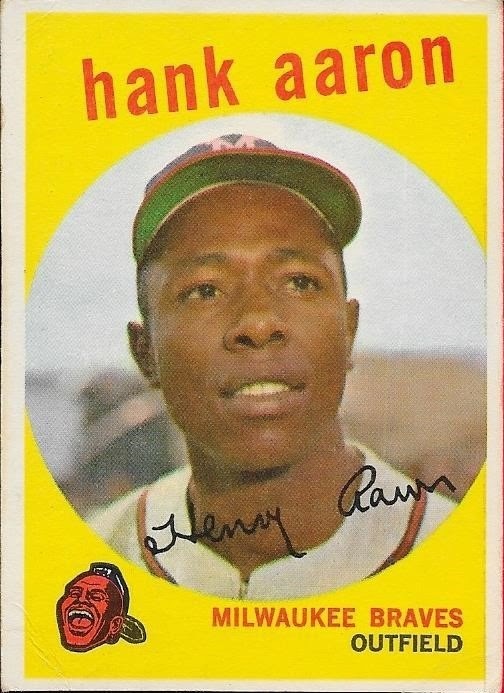 I got a great pickup for my 1959 set of of Ebay recently when I got this Hank Aaron at a great price. I had sold some of my cards, gotten my payments and also got a $10 off coupon from Ebay for selling, so I ended up paying only $12 for this card. Hooray for extreme couponing, foulbunt edition! The Aaron is a major pickup, especially since I already have the Gibson RC and the Mantle. I'm slowly, but surely knocking these out, though. I counted today and after I post another card tomorrow and get in a trade from a really awesome guy on Instagram named Keton, I will need only 304 cards to complete the set. The toughest ones will be the All Stat cards, since they are stars (obviously) and high numbers. We're getting them moving though. I picked up this iconic baseball card off of Ebay a couple days ago. 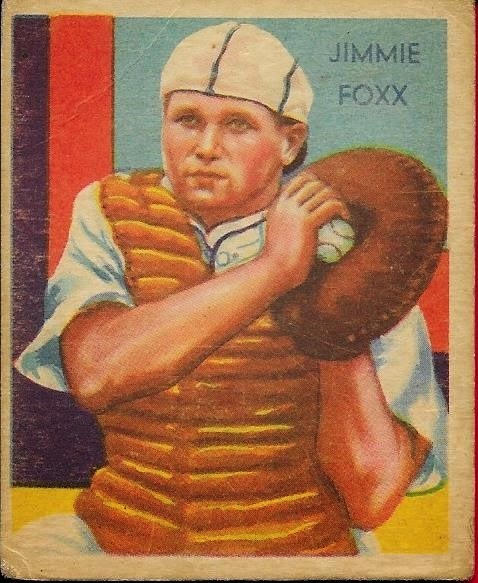 As you can see, it is a Jimmie Foxx 1935 National Chicle Diamond stars card showing Foxx as a catcher. The fact that the card depicts Foxx as a catcher is pretty cool, since he only played 110 of his 2,200 major league games at that position. 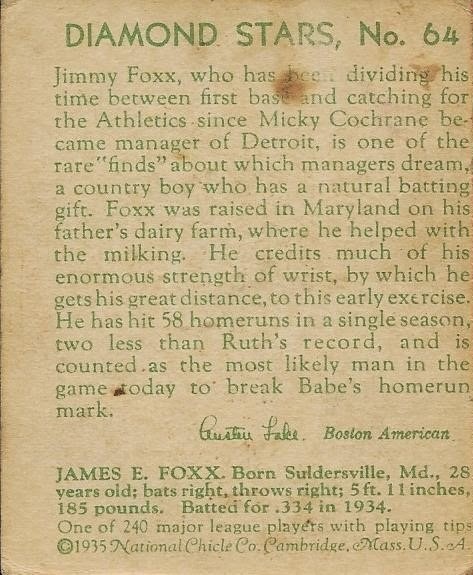 Something else I really like about the card is that it refers to the 58 home runs that Foxx hit in 1932 and that he would be the most likely player to break "Ruth's" record. This is really cool, since we all know that didn't happen and the 58 home runs would be Foxx's personal best. Foxx desperately wanted to break Ruth's record, but nagging injuries limited him later in his career. One would think that had Foxx been fully healthy every season he played, he definitely would have hit more than 50 home runs on several more occasions. I'm really happy I got this card. It looks amazing and is only the second 1935 National Chicle that I have. 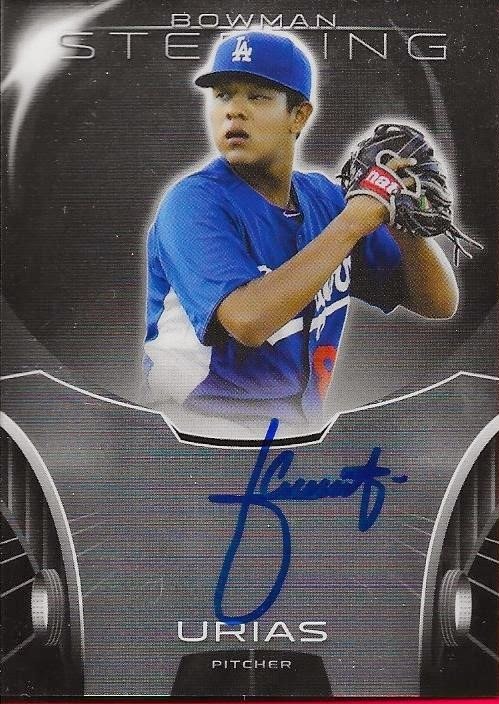 This card is going directly into a magnetic case inside a team bag. I have had this card at the bottom of my "to be blogged" pile for a couple weeks now, mainly because I kept adding stuff from COMC, other Ebay purchases and some trades on top of it and I forgot to blog it. I actually knocked my stack over yesterday while looking for a top loader and remembered that I had this. So, here it is! So much for out of sight, out of mind. 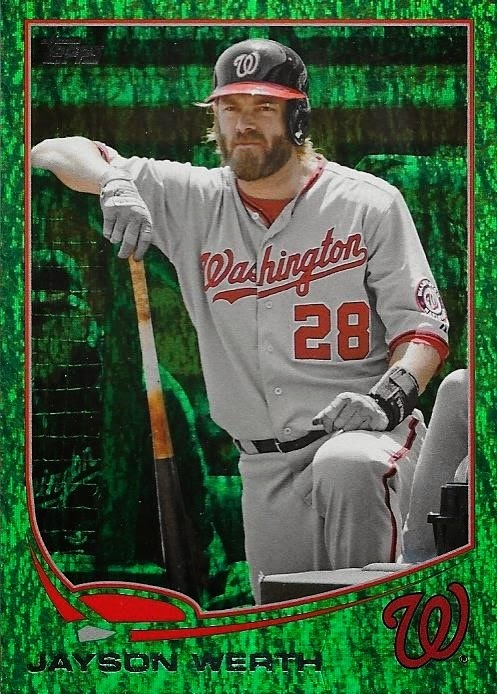 Anyway, I have a yellow version of this card on the way in a trade with Weston, so I wanted to get the green knocked out as well and this one came along at a couple bucks, so I jumped on it. I don't mind the green border nearly as much as others. It's not that bad. A pine green would probably have looked a little better, but this isn't all that bad. Anyway, I'm off to prepare to watch the Orioles' second game of the season. So far (spring training included), I have been happy with their results.